Embark on Star Trek’s 50th Anniversary in celebratory style with the Star Trek 50th Anniversary All Star Crew T-Shirt. The soft navy t-shirt features Kirk, Bones, and Spock along with the Star Trek 50th Delta among the stars with Enterprise. This t-shirt in your collection is the perfect identifier of a true fan. I wanted a shirt to honor the 50th anniversary, since I've been watching Star Trek from the beginning. 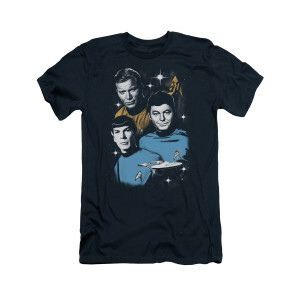 So finding the shirt with Kirk, Spock & McCoy was perfect for me! For all of the old original series watchers, this is a good shirt to have. I like the other series as well, but this was the beginning of it all. So I'm very proud to wear it! I bought this as a gift to myself. I wear the shirt for different occasions: casually, when I sleep, in the gym.